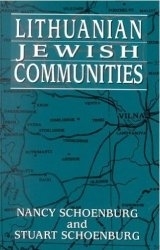 Lithuanian Jewish Communities by Nancy Schaumburg and Stuart Schoenburg. New York: Garland Publishing, 1991. Ushpole is located on the banks of the Shventa. It is near Vizhon, Utian (9 miles), and Sviadoshitz. Head-tax records showed a Jewish population of 109 in 1765. In 1847, there were 515 Jews, in 1897 - 691 (out of a general population of 740), and in 1921, according to the data of "Vaad Haaretz", 514. In 1932, a large section of the town burned, including the beit midrash and the large "minyan" with an attached library. The Jews engaged in small businesses, crafts and agriculture. There were 22 artisans, including 6 needleworkers, 4 butchers, 4 bakers, a metal-worker, a carpenter, and 6 others. The children studied in the cheder or at the school in Utian, which was the cultural and social center of the area. Natives: R. Eliahu and R. Yisrael-Isser, the sons of R. Naftali-Harats Klatzkin. Additional reference: Chapter on Ushpole by Zvi Takar of Nes Ziona, Israel in the memorial book, Utian un Umghengnt (Utian and Surrounding Areas), Tel Aviv: Committee for Remembrance of Jews from Utian and Surrounding Areas, 1979 (in Yiddish).